On the 14th of September, 1992 Apple Computer introduced a new family of Macintosh computers targeting the consumer marketplace. Initially available only in the U.S., the new series of computers were “designed to reach first-time buyers and new users in the home, offering specific solutions for families with school-age children”. Every Macintosh Performa included “enhanced system software, pre-loaded applications [such as ClarisWorks], one year of service and support”, and were to be “distributed in nearly 2,000 consumer retail outlets nationwide”. It was a bold but ultimately unsuccesful move to expand market share by offering an affordable entry into the Macintosh world, rebranding older and low power systems with a new name. The Performas were based on preexisting Macintoshes, although not all of them were exact copies and some even had their own code names. The initial 1992 Performa family consisted of three models: the Macintosh Performa 200, Macintosh Performa 400 and the Macintosh Performa 600/600 CD. 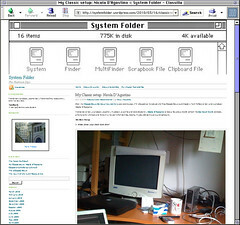 All of them were shipped installed with an optimized version of System 7 called System 7.1P, “designed to make using the Macintosh even easier for first-time computer buyers”. The Performa 200, code named “Lady Kenmore”, was basically a Macintosh Classic II, released one year after the original and bundled with a 2400/9600 baud fax/modem and extra software. It was discontinued in April 1993, one month after Apple introduced its successor, the Performa 250, which was based on the Macintosh Color Classic. 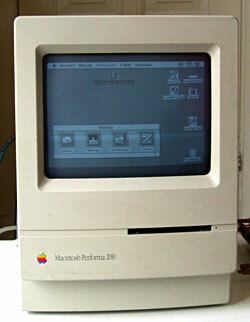 The Performa 400 was a lowly Macintosh LC II, originally released six months before, in March. Bundled with several different hard drives and software, and rereleased in four variants as the Performa 400, 405, 410, and 430, it unfortunately had the same shortcomings of the LC II, i.e. the LC’s 16-bit data path, which crippled the speed of the relatively fast 16 MHz 68030 processor. The Performas 600 and 600CD had the look and were based on the motherboard of the Macintosh IIvi but were released a bit later in the consumer market, and sported the IIvx’s 68030 32 MHz processor. The Performa 600 CD were among the first Macintoshes with an internal CD-ROM drive which could read data, play audio discs and also supported Kodak’s Photo CD technology. The last batch of Performas was introduced in 1996 and discontinued during 1997 and early 1998. Among the last ones was also the first and only original model ever released, the Performa 6400, which had a new tower case design. It was Apple’s first consumer-aimed mid-range computer and had optional A/V capabilities: its innards were also used for the Performa 6360. The Performa 200 picture is © Maja Vervoort, which has kindly authorized the reproduction alongside this text. There is a kinship between Stories of Apple and Riccardo Mori‘s System Folder blog. We both share a mix of love and curiosity for the history of Apple and see it worthwile to delve and discover interesting tidbits of information and trivia to better understand the past, the present and even the future of the company at Infinite Loop. This is why I answered Riccardo’s call to “vintage Mac geeks out there” to share their “corner, small desk, or other secondary space with their vintage setup”, i.e. nothing newer than Mac OS 9. What is your vintage Mac setup? Why are you using this setup? What software do you use, and for what do you use it? In the meantime I’d like to point out the first installment of “My Classic Setup”. It features the answers of yours truly, describing the two PowerBook G3s still actively in use in the house.